Diffusion Interpolation refers to the fundamental solution of the heat equation, which describes how heat or particles diffuse with time in a homogeneous medium. The predictions made using this method gently flow around barriers. In the absence of barriers, the predictions made by the Diffusion Interpolation are approximately the same as the predictions made by the Kernel Interpolation with a Gaussian kernel. The Diffusion Interpolation can use a complex distance metric defined by the cost surface which is a common raster function that calculates the cost of travel from one cell of a raster to the next. 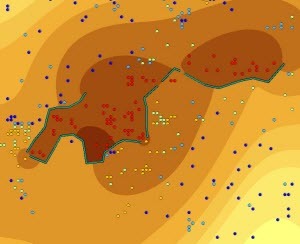 Diffusion Interpolation produces predictions on automatically selected grids (cells), while all other models in Geostatistical Analyst use triangles with variable sizes. Where, Indicator(True) = 1 and Indicator(False) = 0. Flow barrier can be used for interpolating data with preferential direction of data variation. 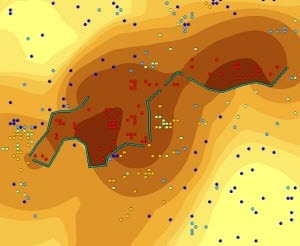 The result of the Diffusion Interpolation With Barriers without cost surface, below left , can be compared with a prediction map created using the Kernel Interpolation With Barriers, right. In the case of Diffusion Interpolation, the shape of the kernel is changing near the barrier according to the diffusion equation, while in the case of the Kernel Interpolation, the distances between points are changing according to the shortest distance between the points.